We had us some lovely weather this weekend. Evan enjoyed himself some morning sunshine as it shone through our back door. That is, until his mom brought over the camera. That darn thing makes so many shiny lights on the walls, Evan doesn't know what to do with himself. They're so sparkly! So pretty! They're even on the ceiling! We hope all of our furiends have had lots of sunshine and lights to chase as well. Happy Monday! We now have a question for all of you. It's like a poll, sort of. You see, we're working on a couple of side projects, some of which at least in part relate to this blog and involve some furry fun. We hope to give you more details soon, once we get a bit more into them and have a better idea as to how things are going. But that's beside the point for the moment. To make a bit more time for our side projects, this human needs to do a very small change-up on this blog. It's nothing huge, but we'd like your input. We easily decided that we do not wish to skip any of our daily posts in order to make more time for our side projects. Instead, we need to make the creation of our daily posts just a bit quicker, to make more space in the schedule for our side projects. The parts of our daily posts that take the longest are our daily doodles and our daily tips. We do not wish to get rid of both of these, but instead aim to decrease the frequency of just one of them. So, the poll is: Which do you enjoy more – our daily doodles, or our daily tips? I think I might know the answer to this. If I'm right, the answer is also the one that I myself enjoy more. So, please do be honest and let us know if you would prefer our doodles or our tips as the one to remain daily. Evan was jealous of Thimble's witchy piece that we entered into the Caturday Art blog hop this weekend. To appease this mancat's magical side, I doodled this up for him. Window dressings are necessary for such things as privacy and keeping out extra heat from the sun. That being said, if you have cats, be sure to take them into consideration when selecting what you'll be placing over your windows. Cats are often tempted to climb curtains, can get tangled up in or break horizontal blinds, and can of course be potentially harmed by ropes or strings used to open curtains and blinds. This is why it is so important to weigh your options when selecting what to use over your windows. 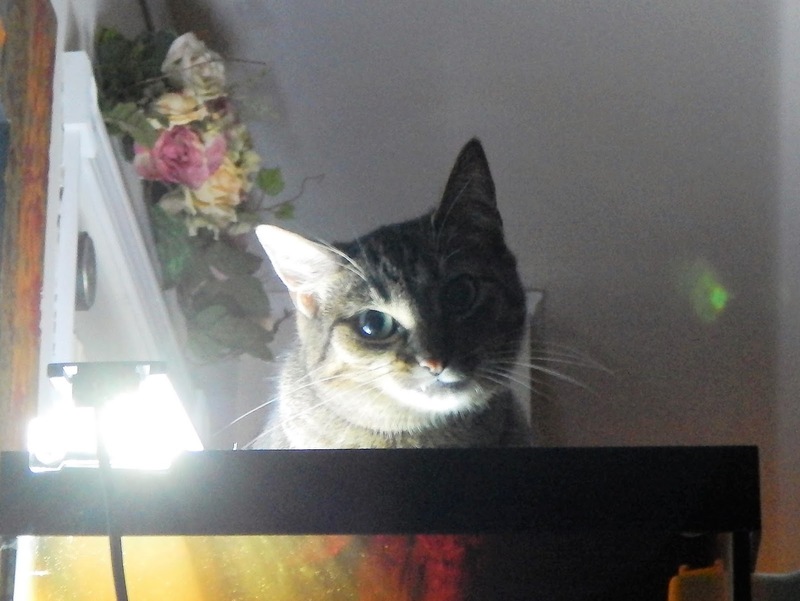 You can try vertical blinds that a cat can simply move aside when they want a window view, but of course you still have to ensure that there are no loose parts or pieces that could get caught on any part of your cat and thereby injure them. Vertical blinds are not the only option, though, of course. You simply have to do your research and select window coverings that will most safely suit your kitties. 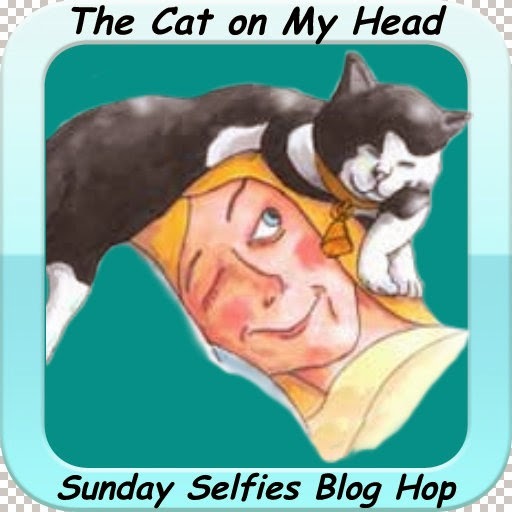 Today is none other than Sunday, which means we're happily participating in the Sunday Selfies blog hop, hosted by our Kitties Blue pals over at The Cat on My Head. And you'll never guess which furbaby here snapped our selfies for this week. Can you guess? Can you? It's this girl! That's right, Eddy not only sat still, but agreed to take some selfies! This momma here loves that snaggletooth. Eddy came to me as a special needs kitty with facial nerve paralysis and a head tilt. Those both still remain, and her facial nerve paralysis gives Eddy a permanent smirk, and I happen to think it looks downright adorable on her. We'll have to savor these, because you never know when Eddy will again agree to sit still and snap some selfies. She's a busy girl, after all. We can't wait to see what all selfies our furiends snapped this week! 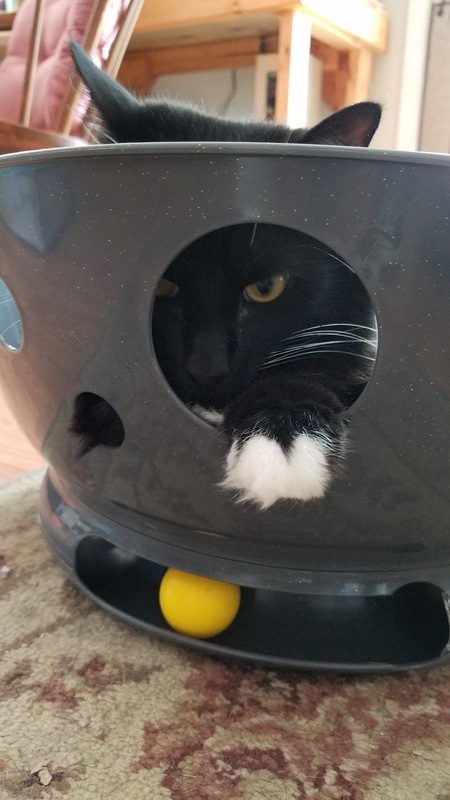 Oh, and Eddy also wanted to show off how much she enjoys her Jackson Galaxy Space Station, which we won from none other than the Kitties Blue, the hosts of the Sunday Selfie blog hop. Eddy usually has Space Station fun with far more zeal than that, but she decided to be a bit camera shy. Though she didn't show this in her shy little video, Eddy also loves to get in the Space Station and slap that ball around from in there. She'll play like that for hours, it seems, and at any time of the day and night. The other day I woke up at 2 o'clock in the morning to her playing with her Space Station. Eddy sure loves her Space Station, and so do the other kitties, too! Thank you, Kitties Blue! Don't forget the importance of acclimating furbabies to various sights, sounds, and experiences starting at as early of an age as possible. The most impressionable age of a furbaby is during their youth, typically especially in their first few weeks of life. 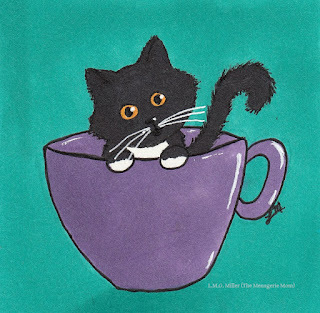 For this reason, when possible, during their first few weeks start getting them used to various sights and sounds that could be considered frightful in a less socialized furbaby. For example, get them used to the sounds of plastic bags and even household noise-makers such as blenders and vacuum cleaners. Also get them used to potentially scary sights, such as umbrellas opening. And, of course, also get your young furbabies in the habit of having their nails trimmed, their teeth brushed, and other such experiences. When it's possible to acclimate a young furbaby to these such things, they are less likely to be a sittish kitty afraid of such things. We sure do love Caturday around here. The weekend is always a welcome sight. 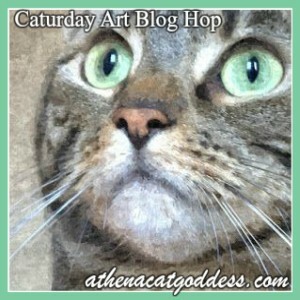 Even more so, though, we always enjoy participating in the Caturday Art blog hop, hosted by the one and only Athena. This human has yet again been feeling a bit on the inspirational side, but has also been craving some fun and fanciful autumn goodness. So, we sort of tried to lump that all together and ended up with this wise witchy piece that may or may not be more suited for Halloween. Is anybuddy else craving some autumn in their neck of the woods? Hoping for some Halloween? We don't want to wish summer away, but at the same time, we also kind of do. Some cool, crisp air sounds quite inviting these days. Who else has been seeing all of the back-to-school gear showing up at stores these days? If you have children going back to school, or if you're a teacher or anyone else purchasing these items, please do be sure to keep all such supplies out of the reach of your furbabies. Items such as pencils and pens, scissors, tape, and so forth can be inviting as well as potentially dangerous to curious furbabies. Pencils being chewed and ingested, for example, can lead to bowel perforation or obstruction. Rubber erasers can also be dangers, as ingestion of them can lead to serious blockages in the gastrointestinal tract. So, if you're one of the many individuals gathering school supplies this time of year, always be cognizant of where these goods are being kept, so that your furbaby can remain safe and sound. Happy Friday, everybuddy! Are you ready for the weekend? We sure are. 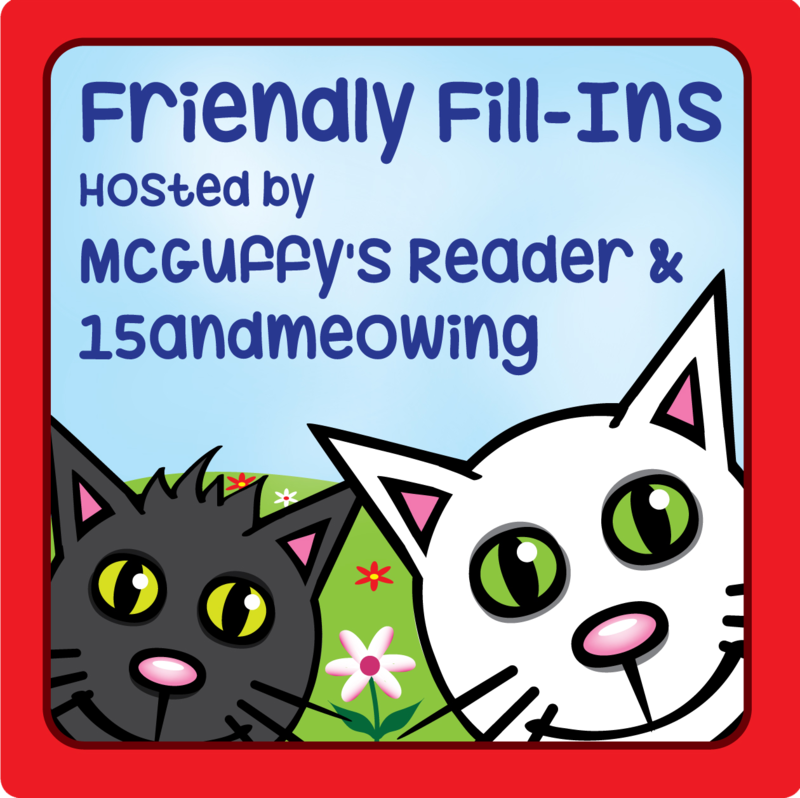 We're also ready for today, because it's time for the fun Friendly Fill-Ins challenge, hosted by our great friends at 15andmeowing and McGuffy's Reader. Today's fill-ins were especially fun. See? 1. As a child, my favorite playground activity was _________. 2. For breakfast, I have _________. 3. An instrument I would like to play is _________. 4. I always try to _________, because _________. 1. As a child, my favorite playground activity was swinging. 2. For breakfast, I have a peanut butter banana smoothie. 3. An instrument I would like to play is the violin. 4. I always try to smile at strangers, because you never know when someone could use some kindness. Now, who's ready for the weekly Eddy fix? You're in for a real treat, because Eddy was just about to tell us a spooky story by the light of the fire aquarium. Does anybuddy have any ghost story requests? We hope we didn't scare you too much! Happy Friday! Eddy gets the honor of sharing our last Christmas in July doodle. This girl is a Christmas tree killer climber, so this seemed up her alley. Some of the kitties around here are coming due for their annual exams and vaccines, and so we thought this would be a good time to remind everyone to try to make those dreaded carriers places of fun and goodness. What's more, try to do this not just near the time of your kitty's vet visit, but year round. When the carrier is out all of the time, your cat has less reason to fear it. Of course, this might not work for all kitties, but it is always worth a try. 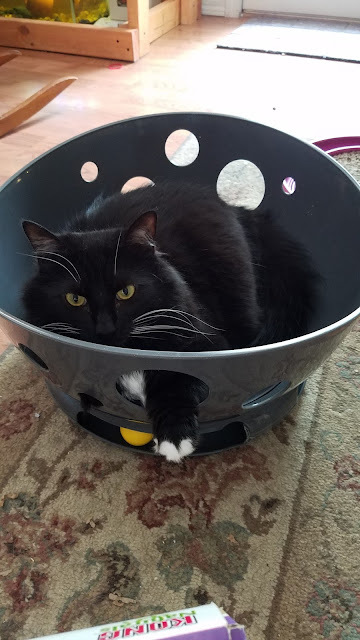 You can even toss toys into the carrier, make it a blanketed snoozie spot, or make it a place where they receive treats, or even moist food or catnip. Make it an inviting place that does not only mean V-E-T. Then, when that date with the doctor does arrive, going into the carrier will be less likely to turn into a battle that leaves both you and your furbaby stressed. We've reached the eve of Friday. In other words, it's Thursday, which means it's a day full of fun. First up, we had fun scribbling up another poem for Thoroughly Poetic Thursday, hosted by the wonderful Angel Sammy and Teddy. This week we find ourselves at the letter G. So, following the poetic theme we've been sticking with, who are we meeting today, and what is their occupation? Well, you're about to find out. Perhaps you’d like a lovely bouquet? Thanks to Gracie the Gardener, our mastermind. Then do take a peek. And has given them their very own flower bed. For they are also such a beautiful sight. Now, would you like some tulips, too? We have purple, yellow, red, and blue. Or is there something else altogether you prefer? Gracie the Gardener can even offer you lovely larkspur. That is not the case, so do not despair. Even goodies like crocus and the delightful mugworts. And Gracie the Gardener will gather them for you quicker than quick. 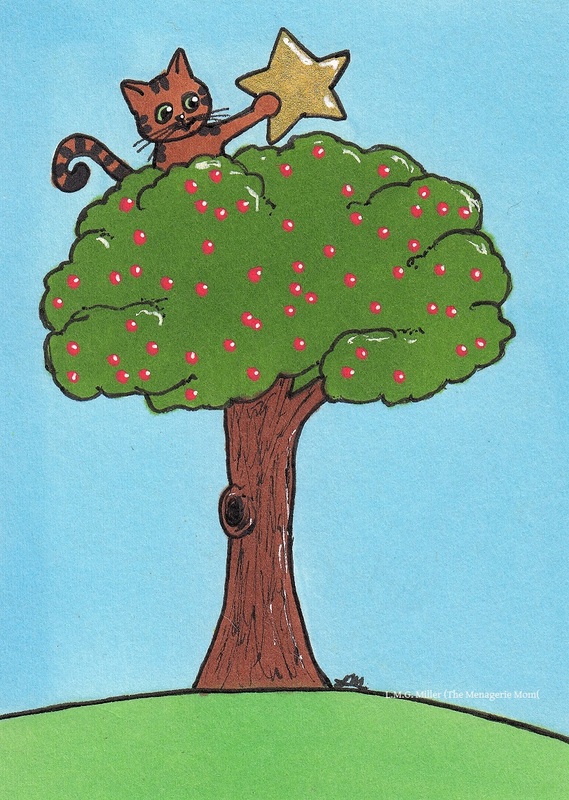 As always, we've created a little doodle for Gracie the Gardener. And if you're wondering who the real inspiration for Gracie is, you'll find her here. Now, Thimble says it's her turn to share her Thursday thoughts. 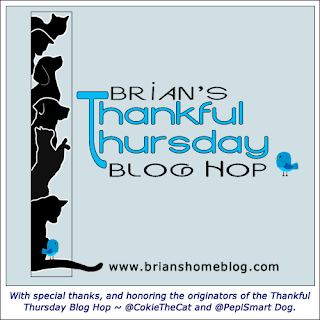 She is sharing her Thursday post with Evan, and even Toby and Astrid, as you'll soon see. To begin, in honor of the recent birthday of Siddhartha Henry, the purrince of the lovely Phoebe at 15andmeowing, we gave a donation to a charity close to him. In return, Phoebe's fantastic mom Ellen sent us some equally fantastic goodies. 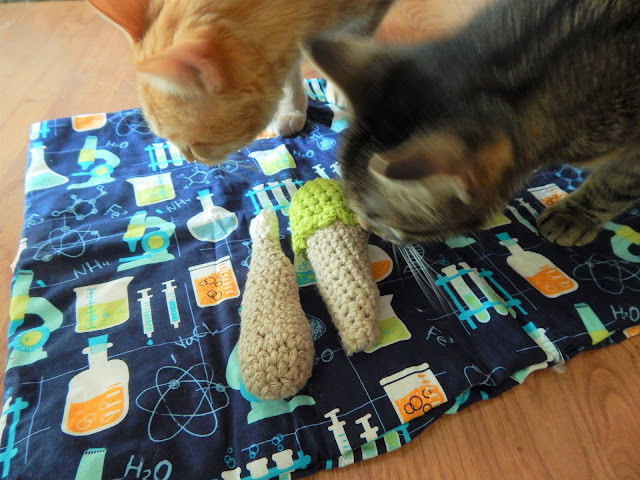 We got us some new crocheted toys, including a drumstick and an ice cream cone (yum! 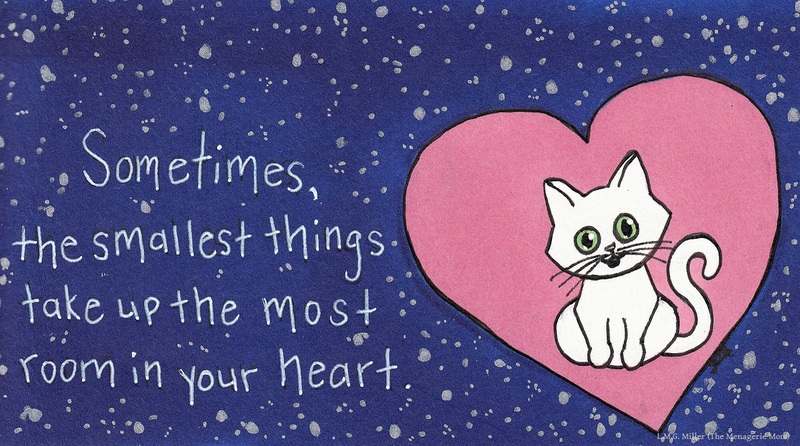 ), and a catnip mat. Let's be honest. 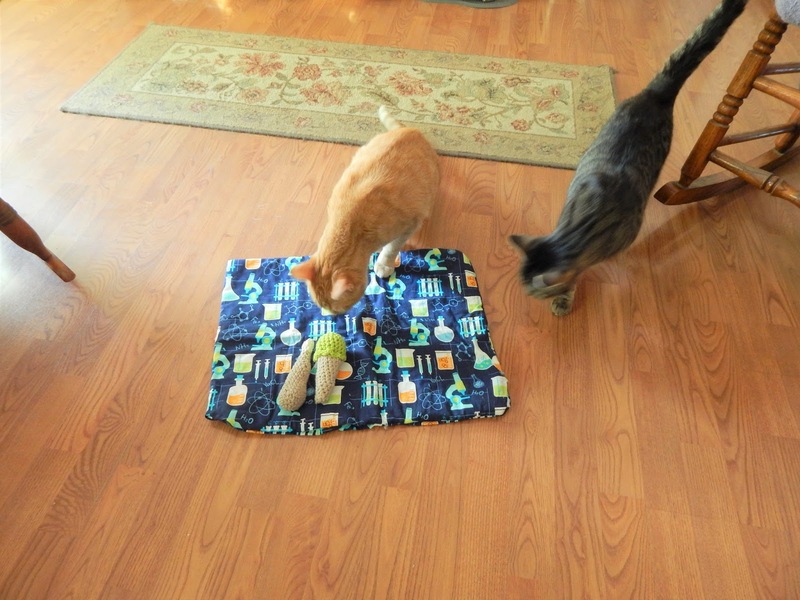 This here human was just as excited as the felines, because the catnip mat fabric was nothing short of fantabulous. I work as a lab tech in a chemistry lab, and pawsome Ellen sent us a chemistry mat. This here nerd could hardly contain herself. 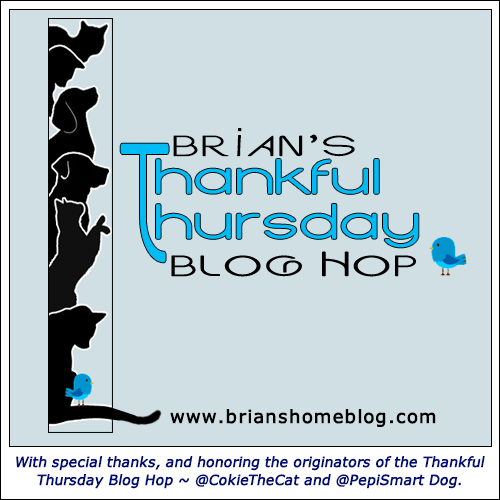 Now, of course Thimble and all of the kitties want to enter their gratitude for Ellen's niptastic gifts in Brian's Thankful Thursday Blog Hop. The kitties here are so thankful for such a niptastic time. We're all so thankful for furiends like Phoebe and Ellen, and all of you! If your kitty's favorite catnip toys start to lose their fresh nipness and therefore lose their appeal, there are easy ways to remedy this. For example, as we're sure most of you already know, you can grow your own catnip. It can be grown outdoors, and will typically come back each year, sometimes having multiplied. If gardening isn't your thing, though, you can also purchase catnip in stores or online, such as in the form of dried catnip. In either of these cases, whether you have your own catnip or have purchased some, and whether it's fresh or dried, you can place some in a baggie or other container and then seal your cat's toys inside with the nip. Let the toys marinate in the catnip for a while, and then your kitty's catnip toy will be like brand new. As another option, there is catnip spray available on the market. As long as you do this safely, you can spray your kitty's toys with this in order to replenish their catnip goodness. Your kitty will thank you for it! Since Astrid got to have her Christmas in July doodle yesterday, she agreed to let housemate Toby star in one for today. 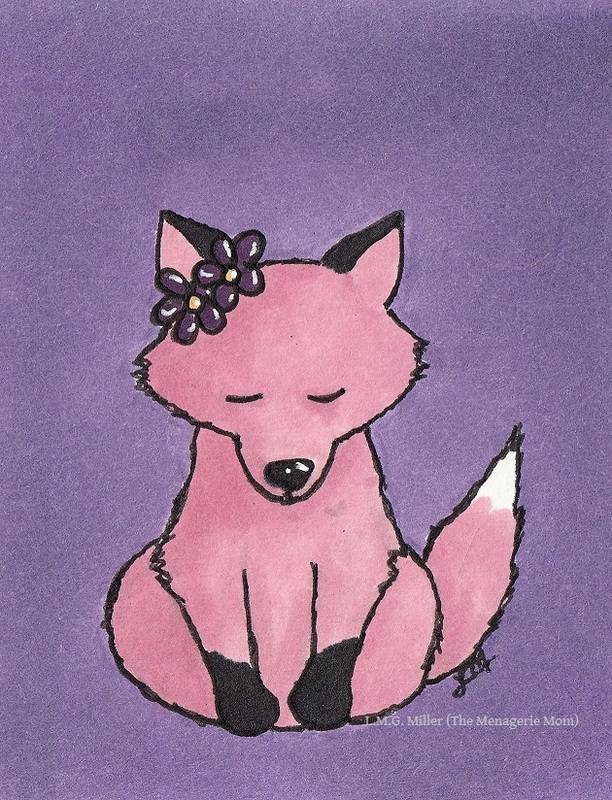 Today's tip is one brought about by the sadness I felt yesterday upon learning that my co-worker's dog had passed away, after she had been outside with my co-worker's daughter, unleashed, and was struck by a car. I frequently cared for this dog when my co-worker and her family went on vacation, and she was one of the sweetest dogs I've ever met. That is why today's tip is to please always consider, understand, and employ the importance of keeping your dog (or even kitty) on a leash when they are not in a safe, confined area. Even those furbabies who do not have a history of running or straying can still become unexpectedly excited or startled and unknowingly run into danger. There are leash laws in many areas, so please be knowledgeable of these. More importantly, though, your furbaby's life could very well depend on you keeping them safe and secure with you. Our reviews as part of the Chewy.com Blogger Outreach Program are a bit late this time around. Why? Because this human is a bit of a flake. I thought I had emailed our choices to the lovely peeps over at Chewy, only to 2 weeks later find the unsent email in my drafts folders. Like a said, what a flake. Better late than never, though, right? At least that's what Astrid thinks. You see, I chose for her some treats that I was more than certain she would love. Rachael Ray™ Nutrish­­­® Burger Bites dog treats were destined to be a favorite. Astrid already loves Nutrish® treats, and she also loves beef. What makes this momma especially happy is that these treats are pretty darn close to the real deal. Genuine beef is indeed the first ingredient, and they contain no grains, wheat, corn, artificial flavors, or meat by-products. And these treats are not only beefy, but also soft and chewy, just how Astrid likes them. And indeed she liked them. Not that you can tell from that winning shot, though. Regardless, Rachael Ray™ Nutrish® Burger Bites get 4 paws up from the pup here! Astrid hopes everybuddy's Tuesday is just as tasty as hers! 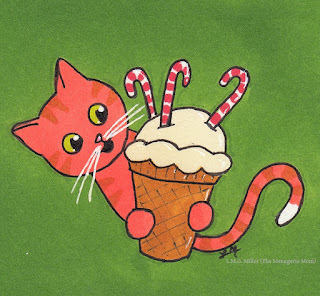 Given what a tasty time she's having, Astrid wanted her Christmas in July doodle to represent that. 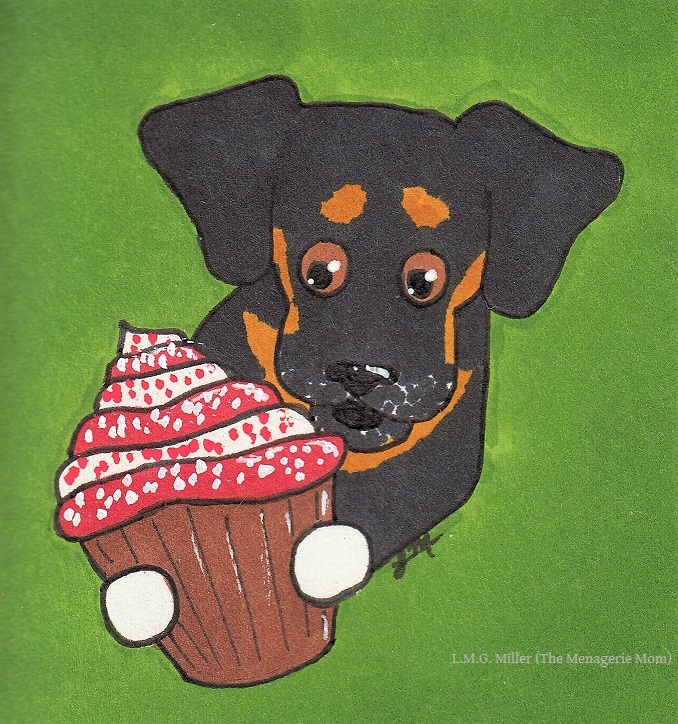 So, here's a peppermint pupcake for you! We've given tips in this vein before, but it's an important one that we'll give again. When it comes to buying food for your furbabies, do always pay attention to the ingredients. Is the food you're buying produced using quality ingredients? Or, are there ingredients that are unidentifiable or that sound suspicious? Are there artificial flavors, dyes, or a variety of chemicals that sound more like they belong in a chemistry lab? By-products are a controversial ingredient, and while in the wild dogs and cats do eat more than just the muscle meat, it is still important to also do your best to analyze if and what kinds of by-products are on the ingredients list. After all, some animals might be sensitive to or otherwise have adverse reactions to certain lower quality ingredients, including perhaps certain by-products, artificial additives, or dyes used in foods these days. Though this is not a guarantee, you might be able to determine the quality of the food more or less by its price. Often, the more a food costs, the more likely it is to contain high-quality ingredients. So, when at the pet store, look at those ingredients lists, look at prices, compare foods, and then make a choice to best of your ability. Your furbaby and their health will thank you for it! For today's Mancat Monday post, Evan wanted to show off his nose freckles. After all, he is quite proud of them. Woops, Evan got a little off-center there. Don't worry, though, he gave it another shot. Ah, that's better. See? There are those nose freckles of Evan's! We hope you enjoyed this nosy post! And we hope everybuddy has a marvelous Monday! We'll still be sharing some Christmas in July doodles this week. For today, Evan wanted to share something that might help us all stay cool in the warm summer weather. Don't forget that our furbabies have a far stronger sense of smell than us humans. When it comes to our kitties, this is one reason why it is so important to regularly clean their litter boxes. Not only is regular scooping of the contents necessary, but also a full scrub-down and fresh litter. A dirty litter box is one of the most common reasons why a cat might avoid using the litter box. After all, going into the confines of a stale, stinky box is not enticing for a finicky feline. So, to ensure consistent litter box use, as well as to ensure a happy kitty, do be sure to regularly clean the litter box completely. The frequency of litter box cleaning will depend on your kitty's litter box habits, as well as how many cats are using it. When it doubt, scrub it out! Thimble was happy to yet again take the lead for our post for the stupendous Sunday Selfies blog hop, which is of course hosted by our furiends over at The Cat on My Head. Last week, Thimble showed off her cute little nose. 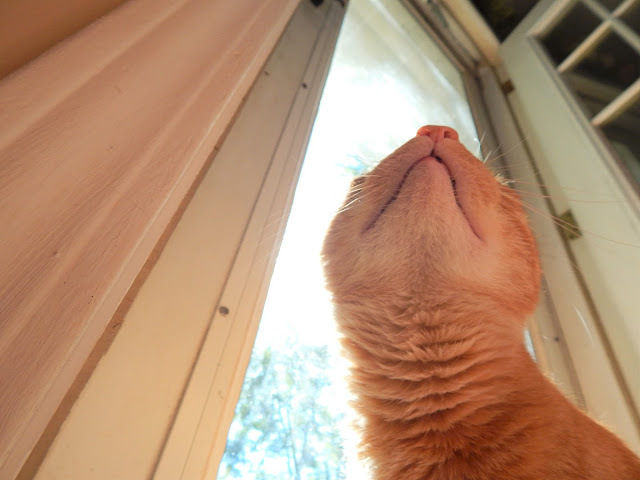 This week, she wanted to snap a selfie to show off her cute little profile, especially those whiskers of her. Now, Thimble and the rest of us here can't wait to see what kind of selfies all of our furiends snapped this week. 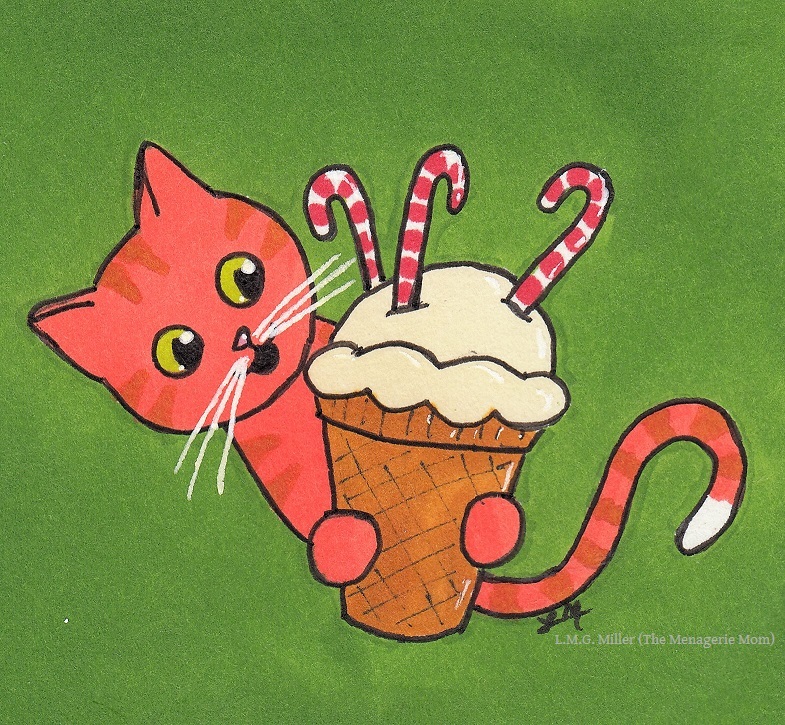 Yesterday we mentioned how we'll be doing some Christmas in July doodles this week. Our furiends over at Mark's Mews suggested that we do one indoors, with the A/C playing a role. So, we did just that. When you are leaving your house this summer, whether it be for a number of hours or a number of days, always be sure to consider any furbabies staying behind at home when deciding what to set your air conditioner to. Sometimes we might think our kitties or pups don't mind the heat, and so we might try to save money by having the air conditioner run very little when we're not home. Some animals might have more difficulty in the heat and humidity, though, such as those who are overweight, geriatric, or those suffering from a respiratory or cardiac ailment. Especially in cases such as these, do be sure to keep the air conditioner set at a comfortable temperature. And many furbabies have just as much, if not more, difficulty with humidity as they do with heat. For this reason, also take into consideration how to keep air circulation at a comfortable level, such by using a fan or two. Of course, in the winter, it also important to consider if your furbaby is not tolerant of cold, and set your furnace accordingly as well. Though I am a huge fan of all things Christmas, I have never really gotten into the whole Christmas in July concept. Perhaps that's because I'm not all that keen on heat and humidity, and it's hard to feel festive when you're melting into a puddle. All that being said, though, despite the scorching heat these days, I actually found myself intrigued by the thought of Christmas in July this year. So, I have decided to do some Christmas in July doodles over the next few days. That may simply involve drying out my red and green markers, but I'm all about those festive Christmas colors. 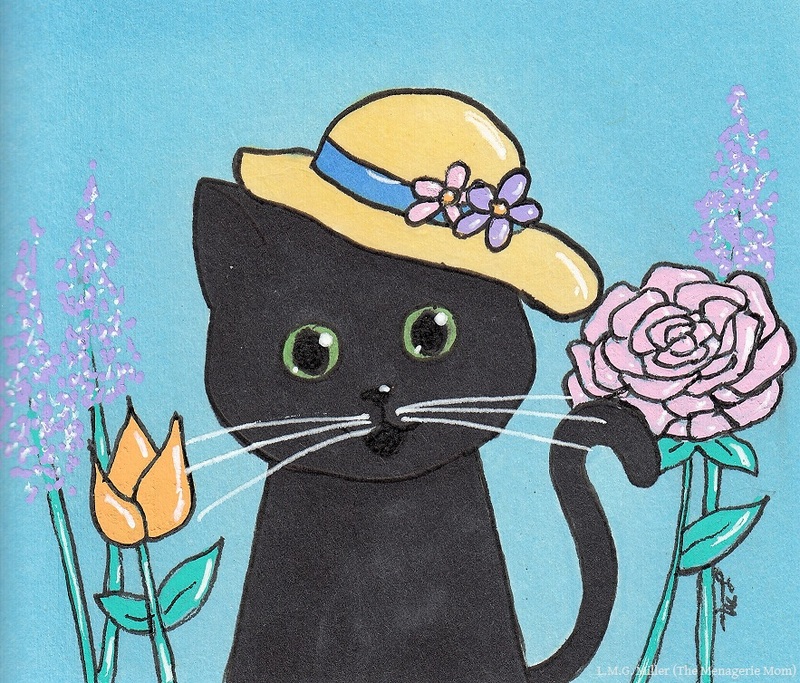 So, to begin this festive summer shindig, I scribbled a little something up for Athena's always fun Caturday Art blog hop. If I'm to be completely honest, I actually don't enjoy the beach. Hot weather and sand are not on my list of favorites. 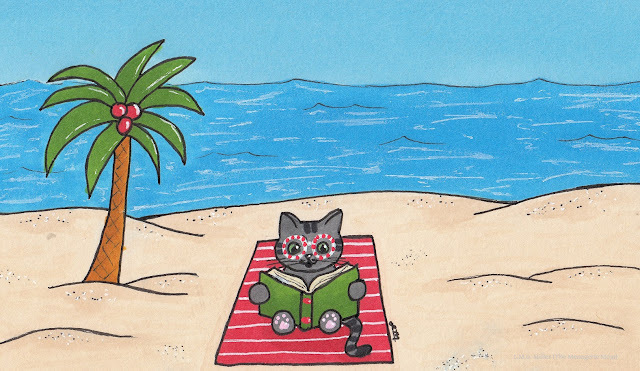 But, when it comes to Christmas in July, why not a festive beach read? Happy Caturday to all! And don't forget to visit Athena to see all of our furiends' art! If you plan on taking your pup (or even your kitty, perhaps) to the beach this summer, always be sure to plan ahead and take all necessary precautions. For example, first things first, ensure that the beach you're considering is indeed pet-friendly. Not all beaches allow dogs, so always check that detail first. Once you've done that, pack and plan accordingly. Consider the temperature outside, and whether it is safe to spend time in the sun. Have an umbrella or other item for shade on hand, some pet-friendly sunscreen, and of course fresh water. Speaking of water, while at the beach, keep an eye on your furbaby and make sure they do not try to make a water bowl out of the tides. Also keep an eye out in the water and sand for other potential dangers, whether it be litter or potentially dangerous critters. And of course we can't forget to mention that you should always consider how to best keep your pup near you, so that they do not run off. Take a leash with you for safety measures, even if your dog is trained and obedient in the ways of coming when called. Summer beach trips can indeed involve that pup (or kitty, perhaps) of yours, but of course only if it is something they could safely enjoy. This week has been a scorcher. Going outside usually resulted in some semblance of melting into a puddle. Nevertheless, we have made it to Friday! The weekend is going to be just as hot here in our corner of the world, so we'll be spending it chilling inside. Now, since it's Friday, guess what's going on? The Friendly Fill-Ins, of course, hosted by none other than 15andmeowing and McGuffy's Reader! 1. My favorite thing on my daily to-do list is _________. 2. My least favorite thing on my daily to-do list is _________. 3. I could really do without _________. 4. I would love to have more _________. 1. My favorite thing on my daily to-do list is my morning workout. 2. My least favorite thing on my daily to-do list is heading out to work. 3. I could really do without this heat and humidity. 4. I would love to have more patience. So, now, all this week the furbabies here have been showing off their love for their new Fish TV. The only one who hasn't shown off her fishy fondness is Eddy. This girl can multitask, enjoying Fish TV and Squirrel TV all at the same time. 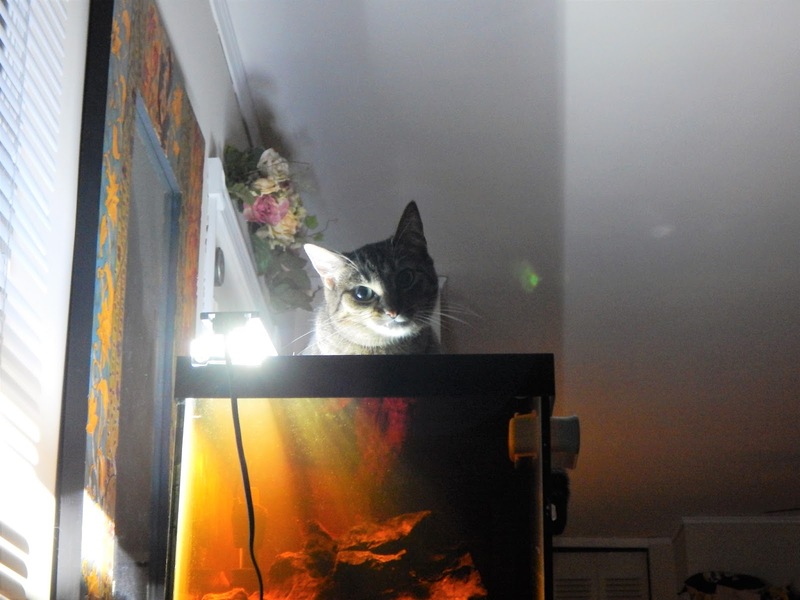 What's more, did you know that a fish tank can make for a great spot to relax? We hope all of our furiends out there have a fantastic Friday! 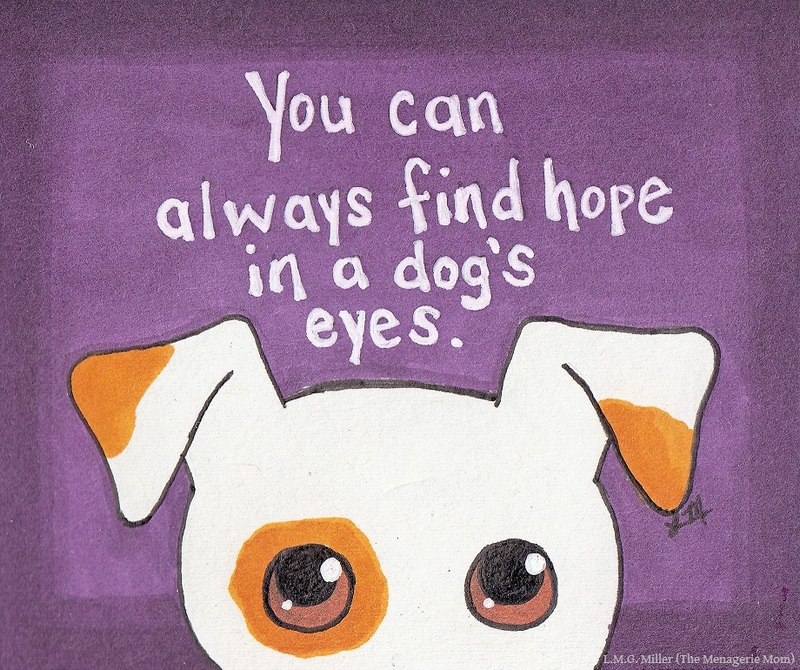 Never forget that, just as with a human child, raising and training dogs or cats takes patience. No person, no animal, can learn tricks or learn what is right and what is wrong without a bit of trial and error, so never lose your patience if your furbaby has moments of slow progress or slip-ups. Teach tricks in short sessions, so that neither of you get tired or frustrated. And during those sessions, use training tools such as treats and toys, which can help keep your furbaby focused and positively rewarded. If you do find yourself growing frustrated, do not take it out on your pup or kitty, but instead take a break, for both your sake and theirs. After all, our furbabies can sense when we are uptight, and that could perhaps even hinder their progress. Rome wasn't built in a day, as they say, and neither can we or our furbabies. Patience is a virtue, and of course that even goes for raising and training a furbaby! Look at us, making our way through the week, already to Thursday. Even better, it's time for the Thoroughly Poetic Thursday challenge, hosted by Angel Sammy and Teddy. Though I am the farthest thing from a poet, I am enjoying this challenge a great deal. I have never been one with a passion or ability for working in rhymes, but I am finding myself eager to write my poem each week. That being said, has anyone noticed the scheme in the poems we've been sharing here on our blog? Some of you may have already realized that each one is about a special little worker. Did you notice the names, though? Coming up with names sure can be tough. So guess what? I've been using names of some of our fellow furry bloggers. So far we have gotten to know Annie the Astronaut, Bubba the Baker, Calista the Carpenter, Dougie the Dentist, and Ernie the Entomologist. Fiona the Ferrier is one-of-a-kind. She is a dear friend with a beautiful mind. On her ferry she is ever on the go. She will take you here and there, to and fro. For her heart is kind and ever so large. There is no land Fiona deems too far away. For Fiona’s voyages bring nothing but cheer. And her passengers sail wherever they please. Do you wish to visit lands with grass ever so green? Or meadows with wildflowers brighter than you’ve ever seen? Fiona the Ferrier can even offer a suggestion or two. She can tell you where the sky is bluer than blue. She can show you a place shining with every hue. And where every day the sky is lit with a rainbow. To this land of the beautiful rainbow. And you can stay as long as you like, even if only for a day. Whenever you are ready, just give Fiona a ring. 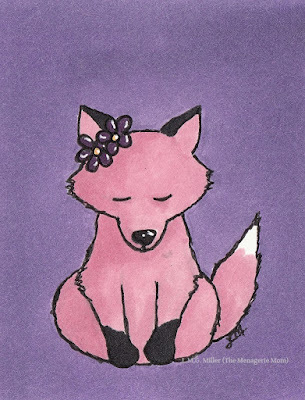 After all, Fiona the Ferrier will kindly take you under her wing. I'm sure many of you already know dear Fiona. To be honest, it was Fiona's mom Janet who really got me interested in joining this poetry challenge. I first learned of this challenge on the blog of her and her kitty crew, over at The Cat on My Head. Though poetry was never before something on my radar, her beautiful pieces always pulled me in. So, now I'm giving it a go myself. Seeing Fiona with her rainbow, Thimble knew exactly what kind of shot she wanted to share for her part of this post. Just like the other kitties here, Thimble loves our new fish aquarium. 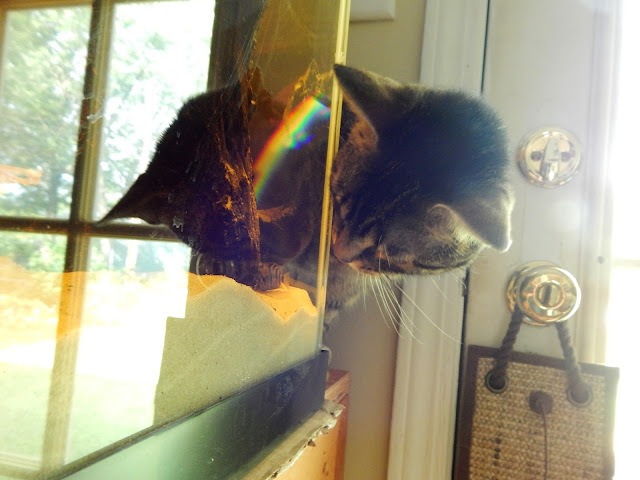 One of her favorite things about it is how sometimes the sun shines in and makes fun little illusions on the glass. You know, like giving it pretty rainbows. 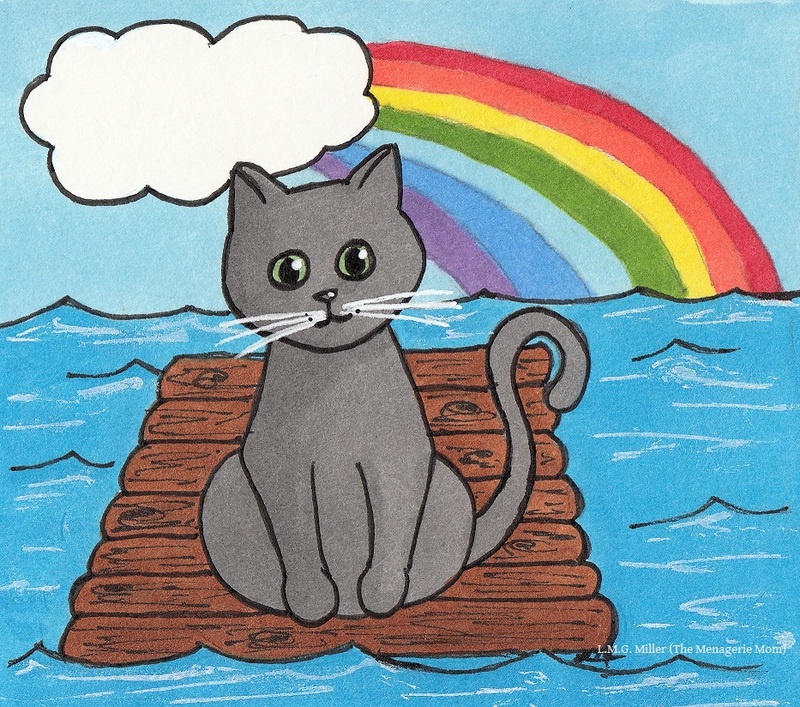 For Brian's Thankful Thursday Blog Hop, Thimble is indeed grateful for Fish TV, and pretty rainbows. All of us here are also thankful for all of our friends, human and furry, both those still here with us and those having a grand ole time over at the Rainbow Bridge. 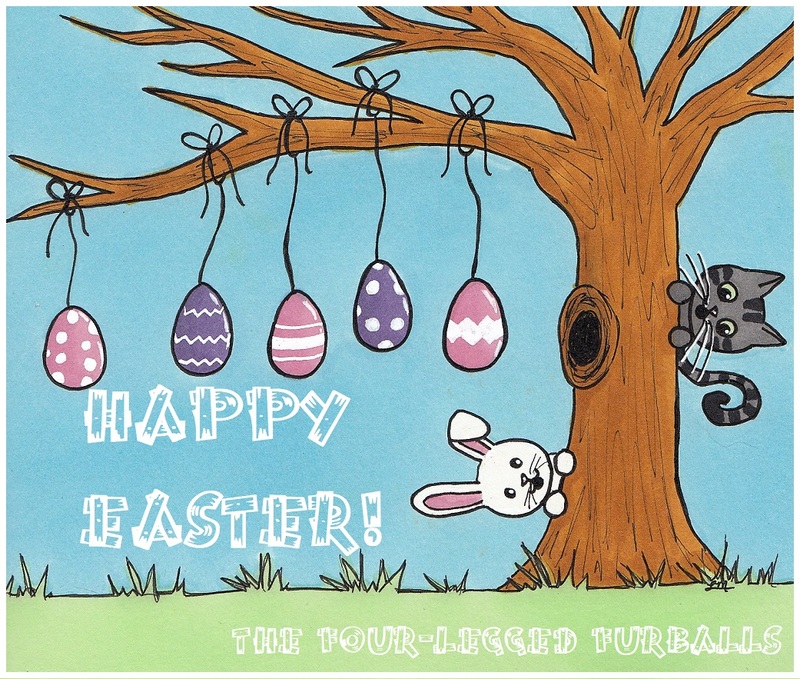 Purrs, barks, and happy Friday to all! No one likes to think of the day they'll have to say goodbye to their furbaby. That being said, as we've mentioned before, do your best to collect wonderful memories and memorabilia during your furbabies life with you here on this earth. Whether it be saving some of their fur and whiskers or taking plenty of pictures and video, try to gather memories while living in the now. Another great idea is to make clay paws or something similar from your furbaby while they're young. Earlier this year, our fellow bloggers over at Cats Herd You shared this fantastic post about making homemade paw prints. If that's something that interests you, do be sure to check it out! So, live each day with your furbaby with lots of love, and gather those memories each and every day. The kitties around here have been enjoying our new fish aquarium. Now, what does pup Astrid think about it? Eh. Squirrel TV is way better than Fish TV, if you ask her. She'll let the kitties have the tank, so long as they leave the window for her. Astrid and all of us here wish you a wonderful Wednesday! Did you know that there is flotation gear for dogs intended to help keep them safe when in or around water? For example, there are flotation vests for dogs available on the market. And if it's a pool you have, there are even floaties made especially for those pups in your life. Of course, kitties could use them as well, if you ever find yourself with one who enjoys a little pool time. All of this being said, if you know you and your dog (or kitty) will be spending time near water, don't forget to consider their safety. Just as with humans, all animals will have different experiences, skills, and preferences when it comes to being exposed to water or swimming. Some furbabies love it, some don't, and some might need a little extra protection to ensure their safety. If in doubt, either keep your furbaby away from water, or be sure that they are equipped with a flotation device. Yesterday, Evan showed off his love for Fish TV. Today, our housemate Toby wanted to do the same. Thimble insisted that Toby share his front row seat. In case you were wondering, Toby's favorite method for getting another kitty out of his way is employing the sniff-the-tooshie-and-hope-they'll-skedaddle maneuver. That is, indeed, what he is doing to Thimble in that there picture up there. She is a pro at ignoring him. We sure do love Fish TV around here! And do you know what else Toby loves? The Jackson Galaxy Space Station that we won from our furiends the Kitties Blue over at The Cat on My Head! Toby's mom, this human's sister, came home the other day and found Toby chillaxing in the Space Station. She snapped these shots and shared them with me. This toy is a huge hit at our house. Toby loves to snooze in it like this, as well as use the scratcher that is inside and that apparently makes for a great mattress. My girls Thimble and Eddy love love love to slap that sunny yellow ball around the track. All the time. Day and night. Eddy even figured out how to remove the ball from the track so that she could chase it around the house. I have since figured out how to keep the ball inside the track, and Eddy's okay with this, as she loves to sit beside the Space Station and get the ball going just like that. This here human is a pretty pathetic photographer and has yet to succeed at getting shots of her own happy kitties enjoying their new toy. Between forgetting to charge the camera batteries and having no clue how to snap a decent action shot, this silly human really needs to get her act together. While I work on that, you can at least enjoy these shots that Toby's mom snapped of him. This one is for the Toesies part of this Tuesday! It looks like maybe Toby would like some privacy. As you wish, Toby. We know we've given this tip before, but since it is something that we happily employ at our home, we thought we'd share it again. And that tip is, if possible, to ensure that your kitty has some interactive toys to keep them busy and happy. More importantly, try to ensure that plenty of these toys are ones that won't be lost beneath furniture, such as by choosing ones that are stationary or large. Such interactive toys can really help to combat boredom in our felines. There are a plethora of enticing interactive toy options, including track ball toys, motor toys (such as mice that run on a small motor), and wand toys, including those that can be suctioned to windows so as to remove the necessity of human hands. 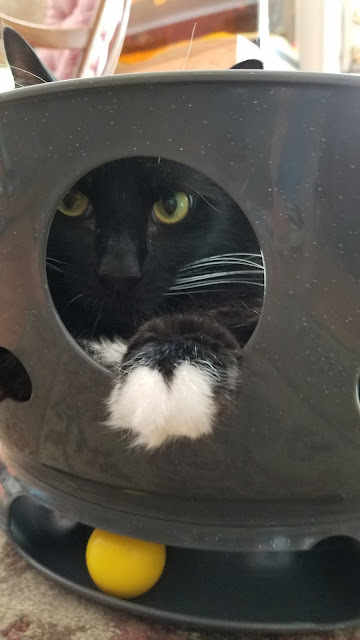 There are also plenty of cat trees, cubes, and tunnels that come with attached interactive toys, to kill two birds with one stone, so to speak. 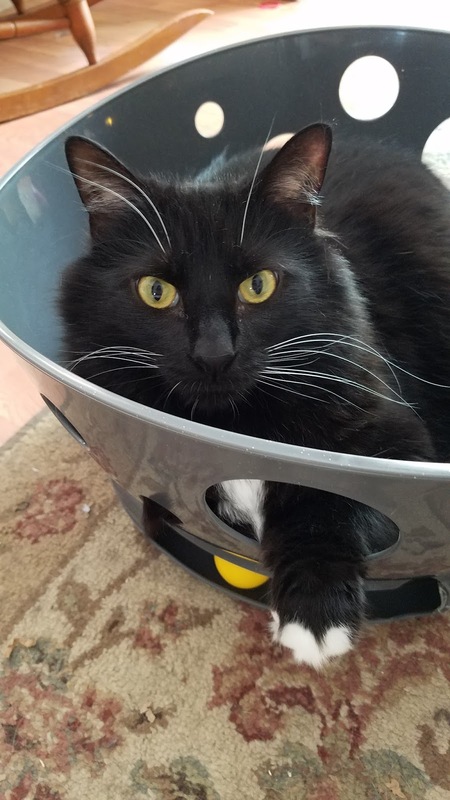 So, especially if you have an active kitty who might tend to get bored, try to ensure that they have some interactive toys that they can rely on to keep their bodies and minds happy and healthy.